Here's to a happy and prosperous New year to all you nostalgia seekers! Best wishes and God Bless from the DYR team. Struggling to find that last stocking-filler for your little one? Treat him or her to some classic children's TV in the form of the recently released Seasame Street Old School DVD boxset. Not only are they guaranteed to fall under the spell of Big Bird, Cookie Monster, Bert and friends, but you'll get to relive some of your favourite memories, too. The triple-disc DVD combines over 7hrs of old-school episodes, 45 bonus segments and celebrity cameos from the likes of Bill Crosby and Johnny Cash, no less! And true Seasame Street fans will go ga-ga over the original sales pitch film from 1969. You also get a 16-page booklet of cast trivia, insights into the show, plus games to keep the kids busy. We got to road-test the DVD this week, which is why we can say the Street hasn't lost any of its appeal. The educational side of things is still sound, targeting 2-6-year-olds (as well as us big kids) and the sing-alongs will have everyone smiling through the festive holidays. You can buy your copy of Sesame Street Old School Volume 1 from Amazon.co.uk (RRP £19.99). Having only just recently commented on losing Oliver Postgate (see previous blog post), it is with heavy heart that I post news of yet another lost legend in Kathy Staff, better known as Last Of The Summer Wine's Nora batty. Everyone's favourite broom-wielding, saggy-stockinged battleaxe passed away at the weekend after being ill for some time. 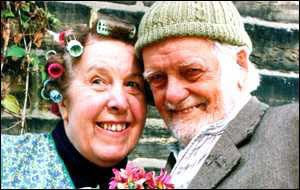 The 80-year-old, who had appeared in the hit sitcom for 243 episodes from 1973 until August this year, will be remembered for her hair net, her gossip-mongering and for being the object of desire for loveable rogue Compo (played by the late Bill Owen, pictured abover). But let's not forget that she also appeared in Crossroads, Emmerdale Farm, Coronation Street and Open All Hours, too. To post your tributes to the late, great Kathy Staff, click here. It was a sad, sad day on Tuesday, when news hit us that the legendary Oliver Postgate, creator of Bagpuss, had died. We have to thank the 83-year-old for bringing the likes of Ivor the Engine (conservative party leader David Cameron's personal fave), the Clangers (Cameron's wife's fave) and Noggin the Nog (not sure who's fave) into our lives, our kids' lives and no doubt their kids' lives in DVD format. 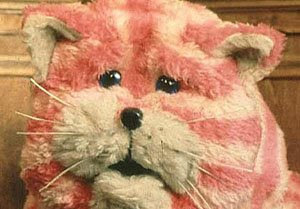 But it was that saggy, pink puss who really got to us - and only this year fans voted him the best TV animal of all time! The cuddly cat was responsible for repairing broken toys in the shop run by Emily's dad, in between those all-important naps, and despite only 13 episodes ever being made, they have been on constant repeat. His animations have been around since the 50s, when he would often script and narrate them from inside a disused cowshed in Kent, with his puppeteer pal, Peter Firmin. But the creator made his last film in 1987, after complaining that TV commissioners were no longer interested in his ideas (boo!). Luckily, Coolbai, which now owns the rights to Postgate's characters, plans to reintroduce them to future generations (and some of us older fans, of course!). We'd love to hear your memories of Bagpuss, Ivor, the Clangers and friends - did you have a favourite? Now's the time to make your tribute! J. Griffiths will be able to reminisce over her new Look-in! Annual after winning our 80s-tastic competition. Meanwhile, M. Walters, K. Savill, G. Taylor, M. Richards and S. Gilbert will each receive a box of Monster Munch in the post this month, to share among friends, family, work colleagues - whoever they think deserves it most! Commiserations to those of you who weren't so lucky - but why not enter our latest competitions for a chance to bag a prize. We have three copies of Lego Batman for Nintendo Wii up for grabs (click here to enter), plus a signed picture of Richard Kiel aka Jaws from James Bond (see blog entry below) plus Quantum Of Solace playing cards (click here to enter). So what are you waiting for?